I am still digging deeper within myself so I can fix my issues before I venture into the next relationship. My next issue, that needs attention, is the matter of marriage. When it comes to marriage, this topic usually is the nail in the coffin! I have been married before and it was an eye opener for me. There were good days and of course in any marriage, there were those unbearable days. Because I have been though a marriage I am hesitant about marrying again; who isn’t, right? Going through the divorce to end that marriage, wasn’t like most. We didn’t fight over anything but it was still a low time in my life. We both knew it was over and time to put our energy elsewhere. We are better now as friends. 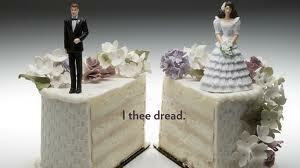 Divorce for anyone can be difficult and it just something that I don’t want to experience again. Some "love struck" people may say that I will find that RIGHT one and divorce may not be an option, but I am a realist that crap happens. How does this fit into sabotaging my relationships? I don’t waste time with getting to know the person before I drop this bomb on them. I just come out and tell them, “At this present moment, I am not looking to get married.” Some men are actually looking to get married or remarry, but that isn’t me! I don’t even give the relationship time to grow. But why should I? Isn’t honesty the best policy? My last boyfriend had marriage on the brain. I have come to the realization that this issue pushed him away; wow I am seeing all of this clearly now! He would ask, “If I was to propose to you what would you say?” I would respond with “if you were to ask today, I would tell you no! Sorry!” I was being honest. All of my friends and family are trying to convince me not to say that harsh phrase “I will NEVER get married again” but try to be optimistic with “if the right guy comes around, I may consider it!” I’m not there yet! And trust he has to be super amazing as well as, he can’t have any “foolery” associated with him! Simply, he better be BEYOND perfect! I know, that is for-fetched! These days I just rather live with a person and when stuff hits the fan, I can call a moving company instead of a lawyer; it’s way cheaper!! As well as marriage isn’t on my to-do list in the future. Therefore, I working on this issue!